Sleepy Hollow is a small town in New York, inhabited by Dutch settlers. Ichabod Crane is the superstitious village schoolteacher. Ichabod is trying to win the hand of Katrina Van Tassel, a beautiful eighteen-year-old girl in the village. When Ichabod leaves a party he attended at the Van Tassel estate, he is chased by a mysterious headless horseman on the lonely road leading to his house. 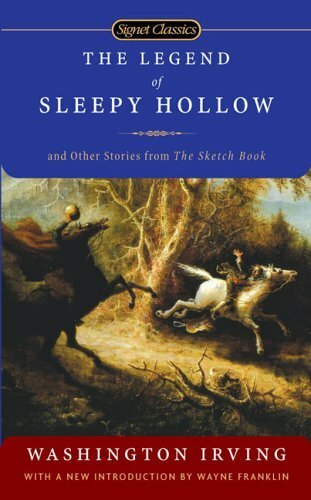 The Legend of Sleepy Hollow is a short story that pretty much everyone is familiar with but not very many people have actually read. I’ve seen the Disney version, the Wishbone episode and the 1999 film with Johnny Depp. However, I’d never read the book (which I happened to own.) This Halloween, I thought I would finally give The Legend of Sleepy Hollow a try. I was surprised to find wit and humor in this book, especially concerning Ichabod (who I still picture as looking like he did in the Disney cartoon.) Irving’s prose is a bit wordy, but I liked his writing overall, especially some of the descriptions of animals and plants. He did a very good job at painting a picture of a sleepy little town. The story is fairly simple, unlike the Tim Burton film. Ichabod leaves a party late at night, and is chased by a headless horseman. Ichabod is never found. I loved how we never know exactly what happened. Overall, it was a creepy ghost story that is perfect for Halloween.